Boring, boring, boring, and I do not have a TV. Is anyone sick to death of the media churning out the same garbage scripts to divert and confuse causing anger then you switch off? 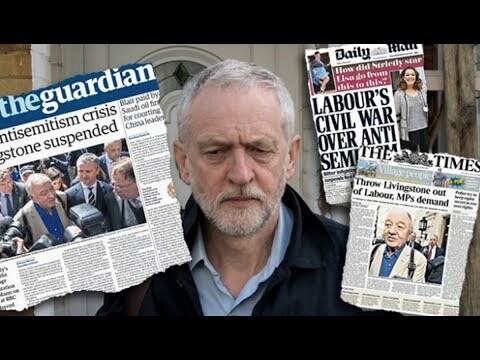 Calm yourself, get out the tea or coffee and read a little truth in the matter of “The Labour Party and Anti-Semitism..
You have all been bashed to death with the old age cover for wrong doing which operates in the reverse by claiming the victim is in fact the perpetrator. Anti-Semitism and Islamophobia are the two current examples. Why are both playground scripts active at the same time? Well, my dear Watsons, when you remove all the glamour it boils down to this simple fact, what used to be a Jewish arm into British politics has now become an arm of the Islamists’, we are of course speaking of the wet lettuce that is the labour party. When Labour was a Fabian and therefore Jewish enterprise, as an organisation, it moved to undermine British industry and private enterprise by having all their communist activists call everyone out on strike. That was the 1970s for you young uns. If you got too close to that truth your were thus labelled an Anti Semite racist pig. Today as an Islamic party, due entirely on the fact, it pumps out our money in benefits, the result of the previous party agenda of dismantling trade and industry forcing the move east for all enterprise to China, the Muslims block vote Labour to secure the benefits they have defrauded since they arrived. Now one may take that as a subtle attack, but what that is, is fact. Facts put truth on the table. In so doing U.K. Islam is directly responsible for all the wars against Islam abroad, as they blindly obeyed the orders coming out of the Mosques and voted for the party that took us into these wars. And before anyone again sees that as a subtle slant, that information comes from the Muslim community itself, of which I know many. It is a fact. Thus you have one playground tribe attacking another…in a country belonging to neither. So now you know what the hell is going on in British politics as we witness her being run by foreign interests in order they can undermine a sovereign land, Manchester is a prime example of invasion in the high rises going up, none of which are British or even European funded. In essence the Islamists have become their perceived enemies by acting in the same manner as the bankers, and in their blindness, have the audacity to lay siege and blame on the British who have paid and helped them build their communities. We are not the Inner City of London folks, and another fact inthemix. Its called a slap in the face and needs to be seen as such if we are to move forward without the rivers of blood, as prophesied by a man who knew the agenda.